A delegation of the Nagaland unit of Bharatiya Janata Party (BJP) led by Deputy Chief Minister, Y Patton went to Thiruvananthapuram, capital of flood-ravaged Kerala with a relief package on Wednesday. The state unit of the BJP through its media cell said Patton, on his arrival, visited BJP Kerala party state office and extended financial assistance for the flood relief. Patton was accompanied by Nagaland BJP legislators including V Kashiho Sangtam, Minister for Soil and Water Conservation, Woman and Child Development and Dr Longriniken, advisor for Law and Justice, Border Affairs and Treasuries and Accounts. Patton, on behalf of the Nagaland Government and also on behalf of BJP Nagaland, expressed their deep condolences to those families that had lost their loved ones in the devastating flood. The delegation also met Kerala Chief Minister, Pinarayi Vijayan later in the evening and handed over the donation of Rs one crore, on behalf of Nagaland Government. 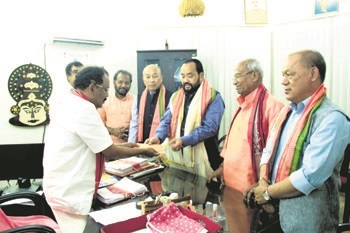 The BJP delegation from Nagaland led by Deputy Chief Minister, who was warmly received by the Kerala unit of the party, would be officially meeting their counterparts on Thursday, the Nagaland BJP media cell further informed.